I came across this costume dress after finding a similar dress at a Halloween store, but definitely not Elena's actual dress. wanting a little better quality dress, I decided on this one because it is identical to Elena's actual dress! It is a little big on my 2 year old but that just means she can enjoy it longer as she can grow into it! The dress is a red satin type fabric and a tulle under lay where the cream fabric is. It does have a lot of glitter, so be prepared for a glitter storm when it is worn! 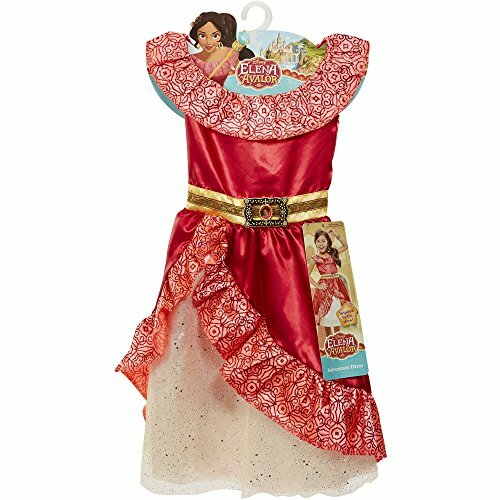 Little Elena fans will definitely love this gorgeous dress up dress!